“Learning from the elders” is one of the great Indian traditions. Within our indigenous communities, age has always been a symbol of great wisdom, insight and experience. So at age 95, it is no surprise that the great yoga teacher, Tao Porchon Lynch has many pearls of wisdom to share with today’s yoga community. 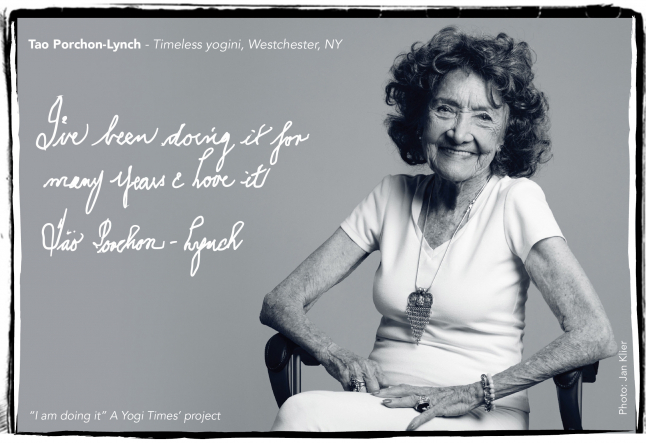 We at Yogi Times had the opportunity to sit down with Tao Porchon Lynch and ask her about her approach to teaching yoga and how it has evolved throughout half a century of her teaching. Donnalynn: How is it that you are "Doing IT" - meaning how is it that you are making REAL change in your community. How is the work you are doing raising consciousness and changing the world? Tao Porchon Lynch: I honor people and support their individuality. I respect their limitations and their fears and I don’t try to push them into postures. Every body is different. The smile on someone’s face when they see they can do a pose is like a found jewel. I try to find the little things that inspire each individual to move forward in their lives and in their personal practice. Donnalynn for YT: When did you first know you wanted to become a yoga teacher? Tao Porchon Lynch: It wasn’t a calling really. In actuality, I didn’t know. One day, I went to take my step daughter to the library for a yoga class and as it turned out, the teacher offered me her class. I immediately started to teach there for no pay as I didn’t think yoga teachers should be paid. Then the European Health Spa on Central Ave had a unique teacher who taught headstand using a book. After meeting her in class, she proceeded to offer me her class. Then Jack LaLanne approached me with a $15/week offer to teach four classes per week. Once he began to insist that yoga students wear sneakers while practicing yoga, I left and opened my own yoga studio. I knew it was time. Donnalynn: How would you describe your style of teaching? Tao Porchon-Lynch: It’s a comprehensive mixture of what I call “pure yoga” - B.K.S. Iyengar’s principles of alignment, Shri K. Pattabhi Jois’ breathing and the wisdom of Maharaja of Mysore who said “just don’t do one style, go through all of them and become your own master”. Donnalynn: How is it that you teach others to "work with the breath of life" and what does that mean for you exactly? Tao Porchon-Lynch: I don’t only teach physical yoga, I rely on the energy body and the use of the chakras and other energetic elements in the body to bring about transformation in the body. The breath of life is our own internal energy field that is all-knowing and all-healing. I tell students that it is critical to tune in to their inner selves (that inner energy) and not go only into the physical but learn to go beyond the physical and into their true selves. It is only by going within that true transformation is made. Donnalynn: Can you tell us about a special experience you might have had with your teacher Indra Devi that changed you and put you on your path of teaching? Tao Porchon Lynch: I met Indra Devi with my uncle. She had come to visit the Aurobindo Ashram in Pondicherry from Chanai and Madras. She was inspirational as she was always following the path of Vedanta and Ramakrishna-the path of trying to find the truth or inner reality. She was open, not just to one belief system, but open to searching for the truth. Many years later when I was at MGM she came to Hollywood on her way to meet Swami Prabhavananda, my swami at the Vedanta Society in Hollywood. Some other close friends in the film business had recognized me and then she approached me and asked in her always straight way of addressing, “What are you doing in Hollywood? Why aren’t you teaching yoga?” I replied that I didn’t think I knew enough. “Nonsense! You have to teach these people some real yoga!” she said. Although a bit embarrassed by her forthright behavior, I was delighted that she remembered me. We spent some time together at the Vedanta Society with Christopher Isherwood, Gerald Heard and Aldous Huxley. Years later our paths would continue to cross and in 1985 at Yoga for Peace in Israel, I met Indra again which further strengthened my commitment to my teaching and established me on this dedicated path of yoga. Donnalynn: Why are you "Doing It" - what is propelling you to keep moving forward at this age and sharing your wisdom and teachings? Why is it so important to you that you do this work? Tao Porchon Lynch: I don’t look at age. There is no such thing as age. I feel as if I teach people NOT to have fear but to find strength from within themselves, they themselves will experience the power in everything. And in such simple words, Tao continues teaching others to find the strength in themselves to make great change - such a timeless piece of advice that we can learn from a very simple and timeless yogini.